Note: Due to DSL internet problems, this is posting a couple of days late. The Gemini full moon was Friday. Thanks for understanding. Tonight we are experiencing the Gemini full moon. When the moon is full, the sun and moon are in opposition to one another, relative to the Earth; the Earth is between them. We know, then, that whatever sign the sun is in, the full moon will be in the opposite sign. The sun is in Sagittarius, and so tonight the moon is in Gemini. Full phase lasts about two and a half days, though the opposition is mathematically exact, within one degree, for about two hours. This was Friday afternoon. The full moon is known to be an intense time. Bartenders, cops, ER docs, cabbies and waitresses can't all be having paranormal delusions, noticed by anybody except the editor of the Skeptical Enquirer. And why wouldn't it be an intense time, with the Earth dangling between the sun and moon, and with all its people feeling the polarity of gravity and other forms of energy? Don't ask modern rational thinking, which says that nothing matters except for guns and money. Ask a witch instead. Astrological signs work as polarities; there are twelve signs in the zodiac, and six polarities, and the opposing signs don't so much contradict as contain one another. Once you get into that kind of subject matter, studying the meaning of the opposite signs, you're really doing astrology -- and it's easy. Crowley puts a lot of astrology into his cards, making the deck an essential tool for any student of astrology. So to illustrate the Gemini/Sagittarius polarity, I will use his cards that represent those signs, The Lovers (for Gemini) and Art (sometimes called Temperance, for Sagittarius). The Lovers, representing Gemini, is the sixth card in the Major Arcana. (There are two decks in the Tarot, the Minor Arcana, comprised of the suits, such as pentacles and wands, and the other, comprised of major figures, archetypes, angels, etc., called the Major Arcana). Art is the fourteenth of the majors. The Lovers represents the principle of duality; polarity itself, generally, the most important polarity in the world, that between self and other. In other ages, this card was called The Brothers and both figures were male; in modern decks they are usually male and female, though old Therion (Crowley) never hesitates to toss us back to earlier traditions, depicting both figures in his card as women. Their opposition quality is depicted by one being black and the other white; the same is true for the two children, but notice their positions. Note also that there are a lion and an eagle, symbols of Leo and Scorpio, respectively. These are not exactly opposites, but they are a strong contrast of symbols (representing two of the fixed signs). 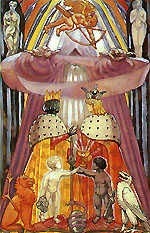 Note the figure behind them, blessing their sacred union. Crowley tells us that this is another form of the Hermit (from Trump IX), or Mercury, the ancient planetary ruler of Gemini. Above is Eros, or Cupid. There is, in this card, the attempt or initiation of the integration of opposites in a true meeting, with the gods smiling on them. We know that Gemini people are genuinely dualistic, that they work in this kind of inner polarity relationship, be it good/bad, masculine/feminine, light/dark, whatever. Leatherboy biker dude might show up at the Oregon Country Fair in a dress, if he's a Gemini. Let's hope the two or four or eight attributes can find time in their busy day to talk to one another. Bikers in dresses aside, Crowley says that the bottom line on this card is the creation of the world, this world being made almost entirely of dualities. Art, or Temperance, representing Sagittarius, is the image of these opposites being fully integrated. It is a new world. The process, now complete, has taken on a creative life of its own. There is one being, involved in the process of alchemy. The one is seen as having many facets. 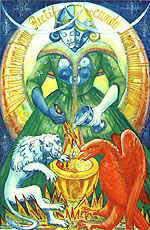 The card is comprised of many of the same elements, including both women (now one, with four breasts, said by Crowley to be a form of Isis), and the lion and eagle, who have joined in the alchemical project, though having reversed colors -- they thus contain one another. The presence of the gods is no longer necessary; divinity has been attained through conscious integration of what seemed to be separate soul and personality, light and dark. There is an inscription, which reads, "Visit the interior parts of the Earth; by rectification, though shalt find the hidden stone." In Latin, the initials of this statement make the acronym VITRIOL, the Universal Solvent (occultism is full of these games). The "hidden stone" is the Universal Medicine. Do we have the notion here that by going to the core of ourselves and rectifying what we find, we can acquire a solvent that dissolves all problems, and a medicine that heals all ills? Looked at another way, we move from the creation of the world in The Lovers to the creation of the universe in Art. The theme of universality is very much a keynote of Sagittarius, whether you take this on the level of Sagittarius being the location of the center of our Milky Way galaxy (the local universe), or Sagittarius being the sign associated with knowledge, or the knowledge of self, or of world culture: the esoteric sign of the Earth, which I will get to when this series continues next week. Full moon blessings at moonrise, from Puget Sound. This link written Nov. 30, 2001.